PHOENIX — So you want to be a better angler. Or maybe you’re looking to pick up a few basic wilderness survival skills “just in case.” And critters? Oh, they’ll be there — up close and personal, too. Whatever you choose to do at the Arizona Game and Fish Department’s 2018 Outdoor Expo – by the way, admission and parking are free – be sure to swing by the Outdoor Presentations Tent in Area 1 (Family Adventure). That’s where a different expert will share his outdoor “specialty” every hour, beginning at 10 a.m. Saturday and Sunday. Here’s the lineup – and bring your questions! 10 a.m. – Flexible Fly Fishing. No need to spend big bucks on a fancy fly rod, reel and specialized weighted line. AZGFD volunteer Bill Larson shares how much fun fly fishing can be with any rod and reel. 11 a.m. – Wilderness Survival. Would you know what to do in an outdoor survival situation? AZGFD’s Jeff Sorensen will offer basic skills that could come in handy if you ever become lost or stranded. Noon – Jaguars and Ocelots. AZGFD’s Mark Hart will talk about recent sightings of these endangered species in southeastern Arizona and how their presence poses challenges for wildlife and land managers. 1 p.m. – Venomous Reptiles. 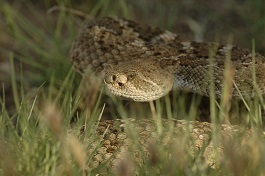 Spring is here, and desert critters like rattlesnakes and Gila monsters are out and about. AZGFD’s Randy Babb will bring them and share some fun facts. 3 p.m. – What Bones Tell Us. All animals have a life cycle, and AZGFD’s Jeff Meyers will share how much can be learned from examining the skeletal remains they leave behind. 10 a.m. – Bass Fishing on a Budget. It’s spring, and that means bass fishing! AZGFD volunteer Mike Koepnick will show you how to get started without breaking the bank. 11 a.m. – What Bones Tell Us. All animals have a life cycle, and AZGFD’s Jeff Meyers will share how much can be learned from examining the skeletal remains they leave behind. For the fourth straight year, the presenting sponsor of this year’s expo is Shikar Safari Club International. Gold sponsors are OneAZ Credit Union, Sig Sauer and MyOutdoorTV. Game and Fish conducts the expo to promote wildlife-related and other outdoor recreation activities. The public’s participation in these activities supports the department’s mission and funding. The department receives no Arizona tax dollars, and no tax dollars are used in conducting the expo. For more information about the expo, including a map, visit www.azgfd.gov/expo.